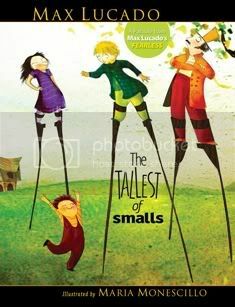 Since we thoroughly enjoyed Max Lucado’s Wemmicks’ books, I was very excited to receive one of his latest children’s books, The Tallest of Smalls. It is written for children between the ages of four and seven and tells the story of Ollie, who lives among the Too Smalls of Stiltsville, and desires a turn on the special stilts that make the person wearing them higher and better than the rest of the citizens. The lesson that Ollie learns once he finally receives his turn on the stilts is that while he may not always be “cool” or fit in with those around him, because Jesus loves him, he matters and is just right the way that he is. The text, with it’s rhyming pattern, is very easy to read and understand. The illustrations by Maria Monescillo are well-done and bring the story to life. Surely at one time or another, every child has felt the way that Ollie does at the beginning of the story and can easily identify with the feelings he expresses. While I would still rate the Wemmicks’ stories as my favorite, this book teaches a valuable lesson, one that not only children, but also their parents can take to heart. You can find out more about the book, which is published by Thomas Nelson and retails for $16.99, by clicking here. This is a Mama Buzz review. The book for this review was provided to me free of charge by Thomas Nelson Publishers. The opinions expressed in this post are my own and I was not compensated for them in any other way. I like Max Lucado. I might have to look into getting this book for Madison. Sounds like it teaches a great lesson.